Your vehicle’s transmission is a complex mechanical system. It controls the conversion of power from the engine to movement in the driveshaft, and without it, your vehicle is as functional as a legless horse. When something goes wrong with your transmission, repairs and replacements can be quite expensive. Because of this, it’s important to stay on top of transmission maintenance and pay attention to any activity that seems unusual. Not sure how to diagnose a transmission problem? 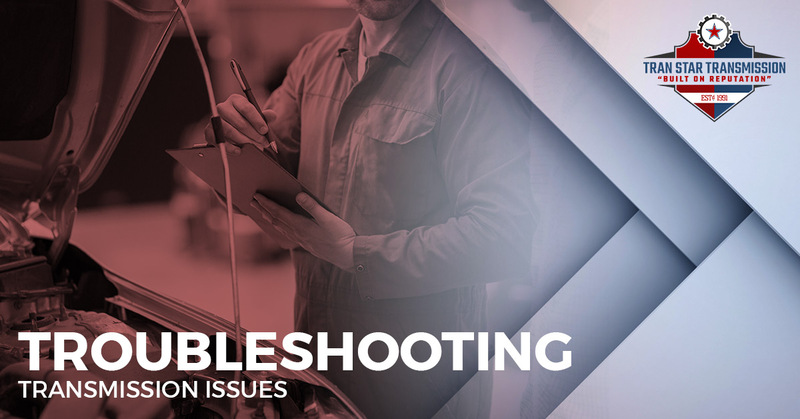 No worries, in today’s blog post, we’re going to offer you a quick guide for troubleshooting common problems. While you do not need to become a total expert, having some basic knowledge of how your transmission works and what it needs, can help save you money in the long run. If you need the help of an expert, bring your vehicle into our Houston transmission shop. Learn more about us, our services, and contact us today with any questions. Cars are supposed to run smoothly, even cars that have passed their prime. When cruising, you shouldn’t experience shaking, grinding, or jerking. The presence of these problems suggests an issue with the gears. For manual transmission vehicles, if the grinding occurs after the clutch is engaged, this is an indication of a clutch problem. However, it could also be because of worn-out gear synchronizers. Automatic transmissions, on the other hand, can be harder to diagnose. If you notice some wiggle or shaking when transitioning between gears, the appropriate course of action is to have your vehicle professionally inspected and serviced. So you’re riding along in your automobile. Your baby beside you at the wheel. When all the sudden, your car refuses or hesitates to go into gear. What does this mean? Well, for one, you might not be stealing that kiss at the turn of the mile (if this hypothetical has placed a song in your head, but you can’t figure out what it is. It’s this Chuck Berry song.) But more importantly, this is likely a sign that you have a transmission issue that is in need of immediate attention. Any time you smell something burning, this is cause for concern. The most common culprit of a burning smell is overheating transmission fluid. Transmissions receive a great deal of wear and tear and experience more extreme heat and friction than most other parts of the car. Transmission fluid helps to keep your transmission cool and lubricated and therefore properly functioning. If the system runs too hot, this can cause fluid to break down and burn, which can then cause the entire system to break down completely, resulting in a costly transmission replacement. Perhaps the easiest transmission problem to diagnose, a leaky transmission is quite recognizable. If you spot a puddle of transmission fluid under your car, the leak needs to be remedied right away. The type of fluid you see puddling will indicate what type of problem you are facing. For example, if you spot dark brown fluid that smells burnt, this may indicate that there are other transmission problems besides a leak. If the ATF is bright red in color and smells somewhat sweet, this likely means that all you need to do is fix a hole. Unlike motor oil, transmission fluid is not burned off, so if the levels are low, this is a sign that there is a leak that needs to be patched. This is just the tip of the iceberg when it comes to transmission maintenance and troubleshooting. But as you can see, adhering to regular transmission maintenance and quickly addressing issues to prevent them from turning into devastating problems can make all the difference. If you have tried troubleshooting your transmission problem, but you are not having any luck, the next thing to do is have a professional transmission specialist take a look at it. Even if you think your transmission is beyond repair and requires a full replacement, it’s best to get this hunch confirmed by an expert. After all, experts deal with transmissions day after day, which has afforded them a skill set and ability to solve problems that you may have overlooked or not been able to handle because of their complexity. If you are in the Houston area, stop by Tran Star Transmission. We’d love to help! For over 25 years, we have been providing top-notch transmission services, including repairs, rebuilds, replacements, fluid changes, and much more. Contact us today to learn more or stop in for your free transmission diagnostic check.